Bitcoin’s at a yearly low? AND there’s a full moon?! Of the three forms of financial analysis, Financial Astrology is probably the least known. Fundamental and Technical analysis is well known to even the layman. Financial Astrology is the third form of financial analysis – and it is used entirely for the purposes of forecasting. 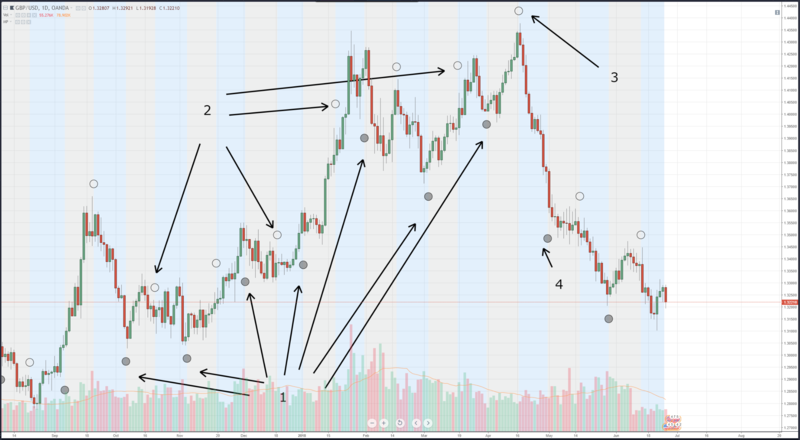 Fundamental analysis is the most lagging form of analysis, followed by technical analysis which is a mix of lagging and leading analysis, and finally financial astrology which is almost entirely entirely a leading form of analysis. My favorite way to introduce people to the importance and relevance of financial astrology is to use Moon Phases. 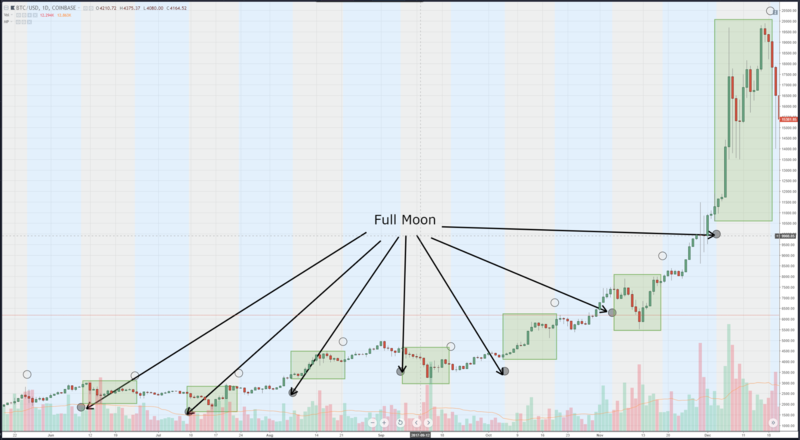 Moon Phases are probably the most ‘accepted’ form of financial astrology to new traders and the non-professional trader/investor because it requires nothing more than to just plot the New or Full Moon on a chart and observe the history of price action – there is little involved in interpretation. Moon phases are just one part of your entire analysis of a market. Moon phases are actually pretty awesome, and it’s crazy to see how often they are respected. 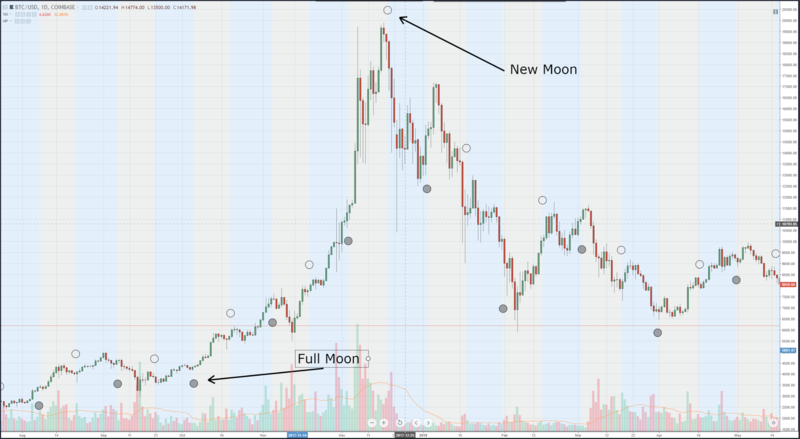 Did you know the all-time high in Bitcoin was at the beginning of a New Moon cycle? Coincidence? Maybe. Let’s look at a chart of bitcoin. The darker moons/moons below price are Full Moons. 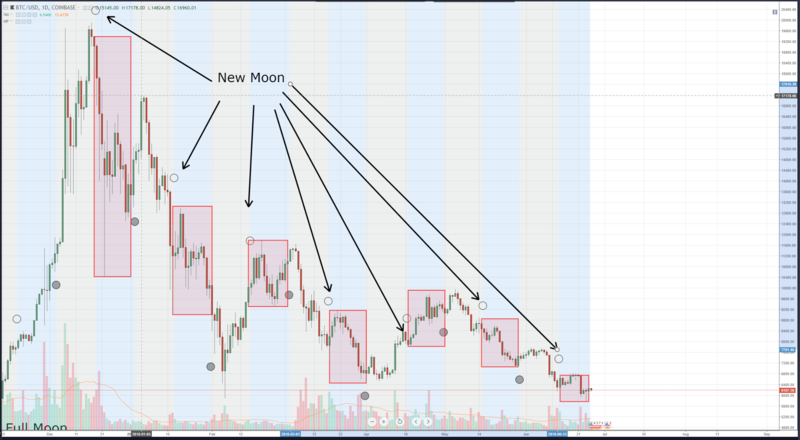 The white moons/moons above price are New Moons (why it’s like that, I don’t know – Full Moons are bright and New Moons… well you can’t see them yet). Let’s also review what each phase generally means for Bitcoin and cryptocurrencies. New Moons have a high probability of appearing at the high of a market, or (more commonly) at a swing high in a trend or range. How to trade it in a bear market: If we’re in a bear market, we short New Moons. How to trade it in a bull market: If we’re in a bull market, we sell before a New Moon or we sit tight. Don’t short New Moons in a bull market. New moons are going to be the best to follow during a bear market. Full moons have a high probability of appearing at the low of a market, or (more commonly) at a swing low in a trend or range. How to trade it in a bear market: If we’re in a bear market, we don’t take long positions during Full Moons. How to trade it in a bull market: If we’re in a bull market, we take long (buy) positions during Full Moons. Full moons are going to be the best to follow during a bull market. Notice the responsive buying and corresponding upwards movement in price during the Full Moons – a strong indication of a bull market. Notice also how the New Moons phases regularly fail to show selling and lower price – in fact, prices mostly remain flat during the New Moon phases. Notice the strong downwards momentum and direction of price during the New Moon phase here. The next Full Moon phase failed to create a convincing return to higher prices. Numbers 3 and 4 tell show us the conditions that are a warning sign for a trend changing direction. How does that apply to our current market? Strong buying and higher price action during a Full Moon. The following New Moon cycle has flat prices and/or higher prices. June 27th is the beginning of a Full Moon.